Welsh housing associations have called on the UK government to reverse the Local Housing Allowance cap. LHA rates are the way housing benefit is calculated for private tenants, but from April 2019 the UK government wants to extend that to social housing. They are worked out using a sample of the cheapest rents in each area. Community Housing Cymru (CHC) said the welfare policy was "flawed" but the Department for Work and Pensions (DWP) said it incentivises work. CHC, which represents 70 not-for-profit housing associations, said the rates do not reflect the reality of the rental market and there is often a shortfall in rent that tenants have to pay. Stuart Ropke, CHC's chief executive, said the "flawed policy" will make social housing unaffordable for those it was built for and for those who need it most. "Tenants face a postcode lottery where, for example, in Neath Port Talbot, they'll only be able to afford to access the bottom 2% of the market," he said. "Our research also proves that the poorest areas in Wales will face the highest shortfalls under this policy, further entrenching poverty in many Welsh communities and reiterating why this policy is a devastating move for tenants across Wales. "Our members are working with Welsh Government to build at least 12,500 homes by 2021, but this unfair policy will put many current homes and many of these new homes out of reach." In 2008, the Labour government changed the way in which housing benefit was calculated for private tenants and introduced a system called the Local Housing Allowance. The LHA rates are the maximum amount of benefit that can be paid and when it was introduced they were set at the median average of a sample of rents in a local area. That meant tenants should have been able to afford half of the private houses in their area. But the UK government has since changed that. The principle now is that you should receive housing benefit that enables you to rent any property in the bottom - or cheapest - third of the housing market. He wants the Welsh Government to apply pressure on the UK government to reverse the policy which "threatens to undermine all our devolved housing policies here in Wales". 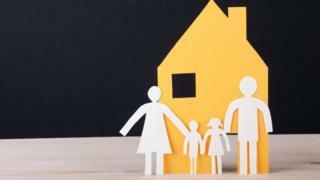 CHC said a tenant living in a one-bedroom property in Cardiff is unlikely to have a shortfall between the LHA rate and their rent, but someone living in a similar property in Powys could have to find an extra £15 a week to pay their rent. A DWP spokesman said: "The best way to help people pay their rent is to help them into work, and employment is now at a record high. "Our welfare reforms are incentivising work and restoring fairness to the system, and we continue to spend £24bn a year helping people across the UK with their housing costs."